Small, Sassy and Outstanding Gift with Purchase! Want a gift with purchase that stands out? 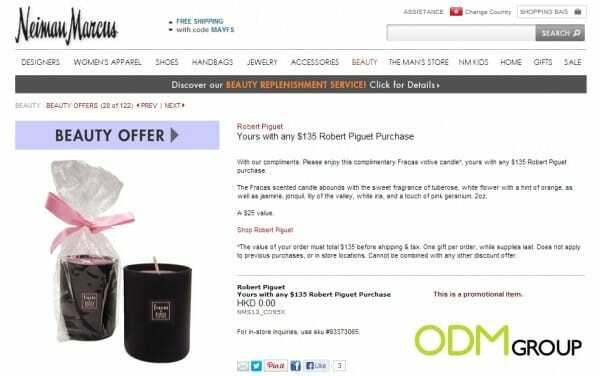 Robert Piguet is offering Fracas votive candles with any purchase of their products amounting to HKD 135. They have a range of assorted candles to choose from. Want something lively and fresh scent, get the white lily with a hint of orange and if you want to go for something soothing, jasmine and white lily would do just the trick. They have many more other scents such as tuberose, jonquil, lily of the valley and pink geranium. Read on to find out more about this interesting scent-y promotion! This gift with purchase is something that is completely different. By offering something so unique, you would definitely pique the interest of the consumer and this will give them the impression of a creative and innovative organization. One that thinks outside of the box. This product is offered in a wide range of scents. This way, consumers who like to collect a whole set will become repeat purchaser. Some customers may also like to use candles at home to feel as if they are living in a spa. By having such buyers who will keep purchasing the same product, it would certainly generate sales tremendously. This gift with purchase can also be used in a few places, at home, in the office or even in a store, if you own one. With a large space to print your brand on, this marketing gift will be one that would boost brand visibility and awareness as well. Ultimately this will generate more sales for your company. This promotional product could also be made of recyclable materials in order to help your company’s corporate social responsibility. With your company being involved in the preservation of the earth, more consumers that are concerned about the green movement would be highly receptive to your company as well.